I’m impressed by how far GetFiveStars.com has come in the last 6 months. 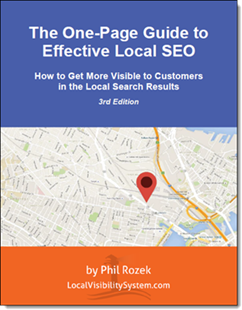 It’s gone from a promising way to encourage reviews to a tool that’s been sharpened by the real-world needs of business owners (and review geeks like me). In case you haven’t seen it – or read my fairly recent interview with Don Campbell – GetFiveStars is an email-based system for asking your customers / clients / patients for reviews. But it doesn’t take a spray-n’-pray approach to asking for reviews: it first asks customers how happy they are with their experiences with you. If they’re basically happy, it encourages them to leave a review on a site of their choice, and provides them with the links and some basic instructions. If they’re not so happy, it encourages them to contact you so you can fix things. The best thing about the tool is it’s always improving. Don Campbell and Mike Blumenthal – the smart guys who developed the tool – have seen to that. For example, one issue that Darren Shaw and I noticed recently was that customers sometimes weren’t sure exactly where to write feedback. The screen that asks customers how happy they are also asked them to write a tiny blurb on their experiences. But some customers thought that was the only feedback they were being asked to write – and didn’t realize the business owner also wanted a review on Google+, or Yahoo, or wherever. Don and Mike streamlined the process by not asking for that little blurb up-front. It also didn’t used to include instructions on the page that contains the buttons / links to the review sites. But now there are quick pointers, right next to the buttons. GetFiveStars is doing an increasingly good job of applying what I call the “zigzag” technique of asking for reviews – that is, not pushing people toward any one review site, but directing them based on what’s easiest for them (and you). Anyway, I think you’ll like the results if you use GetFiveStars for your business or for a client’s. And if you have ideas for how to improve it, I’m sure Don and Mike would love your feedback. If you have any interest whatsoever in getting more reviews – and getting to know your customers a little better – I suggest checking out the free trial of GetFiveStars. This sounds like something that could really help a client that doesn’t have much time on their hands. Right now we just email clients an online letter and ask them to send to clients as they complete jobs. Will definitely check it out! That works too, Jeffrey. It’s always worth trying several different methods and seeing what pulls. I appreciate all of your guidance and suggestions here too. And as you mentioned, Mike and I are committed to a great user experience, and are constantly improving the tool so we welcome any feedback from folks who try out the free trial. My pleasure, Don. GetFiveStars is getting darn good. Hi Phil, I’m curious. 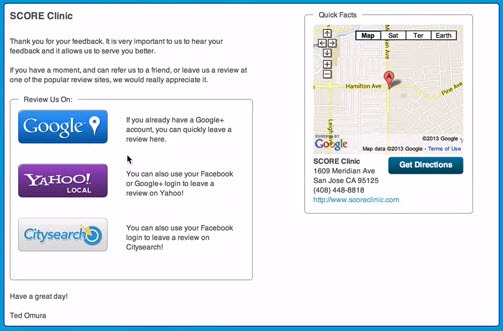 Have you started using the service on top of the battle-tested one-page invitation to review a business on Google+ Local? Thanks for stopping by, Adrien. Yep, I’ve been using GetFiveStars for some clients. GetFiveStars requires customers’ email addresses, whereas my review handouts are lower-tech, so they’re somewhat apples-and-oranges. Which sites are currently supported by GetFiveStars? I saw Google+, Yahoo Local and Citysearch. Are there any Canadian-specific IYPs or SEs currently supported? The other supported sites are Yelp, AngiesList, TripAdvisor, Facebook, FourSquare, InsiderPages, HealthGrades, Vitals, Avvo, and DexKnows. You can also add custom links, if you want to encourage reviews on other sites. I signed up for getfivestar’s trial last week and already obtained 2 social reviews. I think it’s a great complement to the “one-page handout”, specially for business where you already have the customer’s email address. Also, the beginning of the year is a great time to re-ask your customers for feedback as you set your goals for the year. Thanks, checking it out! Looks great.